Learn how world class manufacturers have achieved success with automated welding and how welding automation can be an important step toward prosperity. Written for anyone interested in increasing welding output, quality, consistency, and safety. 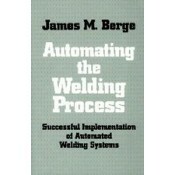 Expertly explains the variables involved in success through automated welding. Provides details on how to estimate startup costs and calculate returns on robotic and automated machinery investments. Discusses the principles that will allow the readers to optimize performance while maximizing the profitability of their welding systems.